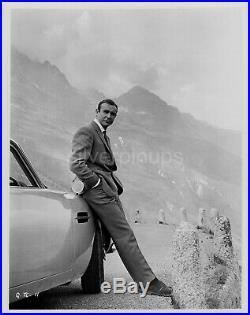 This is an original 8 x 10 inch publicity portrait of a casually cool, SEAN CONNERY leaning up against his 1964 Aston Martin DB5 while filming on-location in the Swiss Alps, Switzerland. Publicity for the 1964 James Bond film, "GOLDFINGER". The photo is in VERY FINE to EXCELLENT condition with minor wear. The item "Orig 1964 SEAN CONNERY as James Bond. Candid ASTON MARTIN DB5 GOLDFINGER" is in sale since Monday, February 11, 2019. This item is in the category "Entertainment Memorabilia\Movie Memorabilia\Photographs\1960-69\Black & White". The seller is "silverpinups" and is located in Winnipeg, Manitoba.